common ground : Fall Comes to the "Creek"
Fall Comes to the "Creek"
Fall has arrived at my Spring Creek booth space. you wouldn't know the difference. and we headed to Ozark to make the transformation. their own touch of fall on the place. and that feeling of wanting to cozy up the nest takes over. are all scattered around the space. I can't resist an owl. are a staple in my space. While I was setting up, a well-dressed retired couple came by. The lady was really interested in my vintage window with the bird prints. She bent down and examined it with a thoughtful, loving, and appreciative eye. that he could " make something just like that"
... with some photographs of birds that he had. and informed him that it just wouldn't be the same. I hope she comes back for it without the hubby. I'll be having a few pieces of my jewelry there also. The Tea Room and store look especially fun this time of year. There are a lot of great dealers with a wonderful mix of merchandise. Hope you can make it by. Click on the sidebar button for details! Oh, Debra, I love your booth!! I have one too and I'm chomping at the bit to have it decorated for fall... my favorite season too. I have a broken arm right now so my husband is going to help me get things ready "for show". I love your fabulous items... especially the mannequin. I'll be back to just look at all those goodies. And thanks for letting us know about Vintage Inspiration Friday. Can't wait!! Debra, your booth is awesome! Had to laugh at your story of the lady shopper and her hubby. Sounds like us. I'd much rather shop alone. Those negative comments and the feeling I have to hurry along are just downers on the whole experience. LOL! Debra, your space looks wonderful...would definitely catch my eye and reel me in! You know, husbands are great and all, but best left home when antiquing. Here's to Autumn arriving early this year...Ha...I live in Florida. Guess I'll have to bring out the Fall and turn down the AC. I would love to shop there, I zoomed in on lots of items that interested me! I am gonna visit your booth someday:) Have a blessed day and thanks for the cool breeze this morning, I love FALL too! Debra, your space looks perfectly autumn-like. I have been so hesitant to leave summer (probably because I was away for half of it and feel like I missed out) but now...there is a bit of coolness in the air today and I find myself looking forward to the changing of the seasons. And autumn here in the northeast is gorgeous! Your booth looks lovely and very inviting! I love the touches of orange, and the nature inspired dishes. Like you, I love autumn and all the fresh, invigorating colors and vibes the season brings. Gorgeous booths! I am always blessed when I come here. I love all of your new fall colors. I do not think you need to worry about your bird window, I have a feeling it is going to sell soon, it is wonderful. It is starting to get colder here at night and the leaves will soon be turning colors. We were lucky to have a wonderful summer but I am looking forward to fall. Love all the pops of black...makes the orange really stand out. Doncha just love husbands? She'll be back...she's heard his line before! I'm going to make the weatherman stand out in the shade where it's 112 until he brings fall here. I so wish that I lived closer so that I could shop with you. Do you ship? I've seen a couple of items I really love. I'll drop you an email for more info. Gorgeous, gorgeous, gorgeous. How fun to have this space to play with. You've done a great job with it all. But it's 105 here, hottest of the year so Fall is still a ways away in So Cal. Just can't quite do it yet. But I have loved enjoying yours! 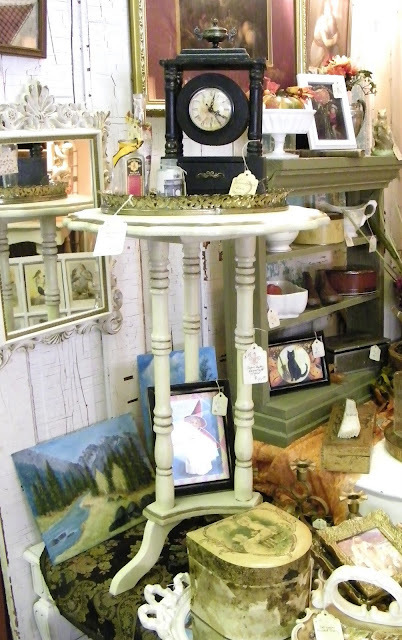 Hi Debra ~ All your displays look great ~ Fall is amazing. Im ready! I could go hog wild in your shop. I hope I can get out there someday. Until then, looking forward to your First Vintage party. I just love all of your diplays and vignettes. You truly do a great job decorating and making everything so appealing!! I was scrolling through your photos and saw that window with the birds and remarked to my husband how very pretty that is - then I read about the lady and her husband who saw it. I laughed thinking "yep that's me and my hubby". I love the jewelry on your 'non-nekkid' dress form! I was thinking how pretty it would be to have some vintage lace draped over her shoulders. Debra your booth looks FAB!! I could shop in there for DAYS!! I love Fall too and with the temps we have been having down here in the triple digits, I am READY for it! So pretty!! I LOVE the bust in the first photo! Your enthusiastic energy for the fall and all you love about it came through just beautifully!! Thanks for letting us browse through! Oh Debra, love your fall decorations, your booth just looks so inviting! I would just be so happy just to wonder around and marvel at all of your wonderful treasures! Oh my, I am so thankful fall is coming! Hi Debra! I love your booth! Thanks for the tour!! It looks so lovely, wish I could visit in person. Thanks for your sweet comments on my post. I hope the lady comes back for the window, for your sake and for hers! Debra, Everything looks wonderful!!!!! I too am a fool for fall & love to see the change of season from the HOT summer to fall & all her glorious colors. Thank you for sharing & giving all of us a glimpse into your beautiful shop! HUGS! Debra, your booth is AWESOME!!!!! I can't wait for fall either!!! You've made me want to pull out all of my pumpkins and acorns!! Hi Debra!! Everything looks so pretty. It all looks so good girl, you put me to shame! Hi Debra everything is just too pretty for words...love you taste. I also love that you don't have music on your blog. I'm usually listening to music if I want to and find blogs that play music just a little too much. Most times one has to scroll to the page bottom to turn the player off. I'd like to see someone blog about music and suggest 2 things. 1...just say no. 2...put the player on top so visitors can turn it off if they are not interested in listening. Sorry...if I am being rude, that is not my intent. The several I've encountered this afternoon have been loud and one you couldn't turn the player off...things just seem to be out of control. Looking gorgeous Debra....fall is such a pretty time of year. I was in Michaels yesterday and saw they were putting out all their Christmas merchandise! So gorgeous! I want to jump inside my computer and go shopping in there!!! I'm ready for fall too-I've already taken fall and halloween into my booth! Just beautiful! Stopping over from Sissies! Pumpkins are really calling me this year, they are just so wonderful, I love seeing yours tucked into various spots-enjoy! Your booth is so charming! Love it! I've been trying to get in a Fall Mood but is not happening....maybe tomorrow...your post might be the push I need! Debra, Your booth looks amazing and I love all the Fall colors! I have not only had people say "I could make that" but want me to give them details on how to do it themselves. I cam over from Sissies and I am so glad I did, I also have a booth and you both have given me some great ideas!! I am your newest follower, I don't want to miss a single post! Wow! Beautiful...I love it all!!! I love how your booth looks. The suitcase really looks great with all the vingettes inside. I always get a lesson from you when it comes to fixing up my booth. I am now even more inspired to get my fall look together. I can relate to that comment by the husband. However, when one woman admires one of my pillows the other woman will say, "Oh, you can make that, it's so easy!" Yeah, right!! You won't believe this but my son and his wife live in Ozark, MO and I have been to the Tearoom many times and have bought things.....lunches are great too. You may even know my daughter-in-law as she grew up in Ozark. Her name is Lindsay Harmon and now Lindsay Ash. She teaches. Her parents are Dennis and Sharon Harmon. What a small world.